Only a few months after the Illinois Department of Transportation showed off its most recent concepts for the Lakefront Trail as part of the North Lake Shore Drive reconstruction planning process, last week IDOT presented potential designs for transitways on the drive. This meeting marked the latest step in the process of narrowing the plans for the rehab down to three or four alternatives by the end of the year. IDOT presented four fully-fleshed-out alternatives. “Transit Advantages” features mostly minor improvements such as bus queue jumps. “Bus on Shoulder” is similar to what Pace already does on some of their regional routes. “Dedicated Transitway – Left” features a center-running busway (i.e. to the left of the mixed-traffic lanes) with access ramps at key junctions. And “Dedicated Transitway-Off” scenario would be similar to the Transitway system in Ottawa, Ontario, which features buses on corridors above or below the normal street grade. Both Chicago transitway options would likely be built with future conversion to light rail service in mind, similar to what was eventually done in Ottawa. Unfortunately, all of these IDOT options would involve widening Lake Shore Drive, which, with eight existing lanes, is already a massive barrier between the city and the shoreline. The department is proposing to do park expansions in conjunction with the roadwork so as not to reduce the net acreage of green space. IDOT’s analysis found that all four configurations would perform significantly better than the existing layout, shaving off anywhere from 20 to 30 minutes in average travel times based on models using the Chicago Metropolitan Agency for Planning’s GOTO2040 data of regional travel habits plugged into a commonly used traffic flow simulation software called VISSIM. Transit ridership increase projections were also encouraging with the Dedicated Transitway – Left scenario predicted to result in a 50 percent ridership bump while the other layouts are projected to lead to a 40 percent increase. The NSLD reconstruction is estimated to cost $2-$3 billion total. The transit improvements are projected to cost anywhere from $5-7 million for “essential improvements” to $206-248 for the Dedicated Lane options. Surprisingly, after laying out the four different transit scenarios, IDOT officials told meeting attendees that they’re no longer considering the Bus on Shoulder and the Off-Alignment Transitway. This leaves Transit Advantage and the Center Running Transitway as the remaining candidates of these four transit-centric options. However, the department is still considering a scenario with “managed lanes” that could be used by buses as well as motorists who pay a toll that would be raised as the number of vehicles in the lane increases, a strategy known as congestion pricing. Adding bus-only lanes to North Lake Shore Drive without widening it, the best option, is also still on the table. However, confusingly IDOT is classifying this alternative under “managed lanes.” These two options will be discussed at the next NSLD task force meeting. Here are some more details about Dedicated Transitway-Leftworthy. This alignment offers mostly center-running dedicated bus lanes with access ramps at key junctions. 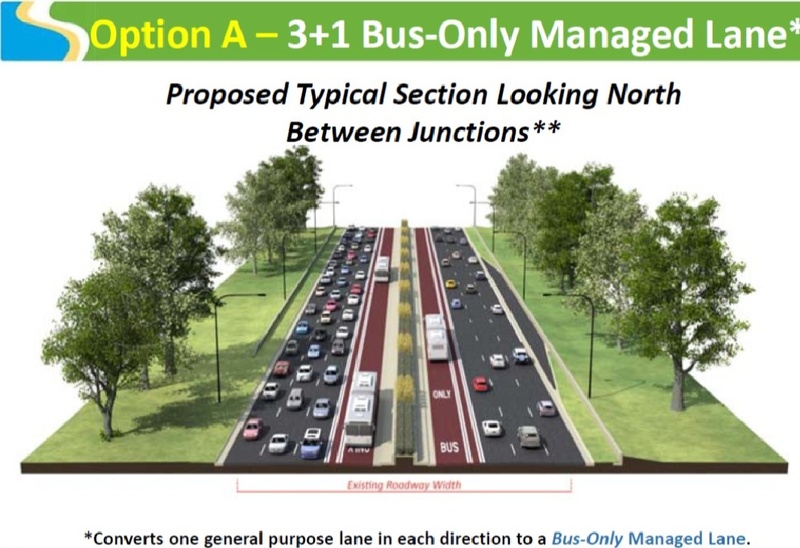 Unfortunately, no bus stations are proposed within the median, as IDOT says these would take up too much right-of-way. However, the ramps would all have bus priority signals and possibly gates to ensure that drivers don’t enter them. Rendering of Belmont Harbor with trail separation. The most significant change would be at Belmont Avenue, where the proposal calls for pushing the shoreline east into the harbor via infill. Buses would be given more dedicated space to enter and leave the drive, along with new turnarounds for the many routes that terminate in the area. This configuration would also relocate the existing northbound off-ramp and add a second on-ramp a block north at Aldine, a necessary evil if cars are to be removed from the mix at Belmont. The proposal also calls for creating separate trails for cyclists and pedestrians, with the bike trail located closer to the highway. But this could be controversial because it would likely result in worse air quality for bike riders. While the focus of this meeting was transit, a few drivers present said they were worried about the transit improvements creating more congestion for drivers, which would certainly be a non-issue if no mixed-traffic lanes are converted. They also complained that center-running bus lanes would worsen the view from behind a windshield. There were also new concerns about IDOT’s proposal to eliminate the LSD access ramps at Wilson Avenue in light of the recent announcement that the nearby Uptown Theater will finally be reopened after being closed for decades. The Active Transportation Alliance has pointed out that if we’re serious about reducing car dependence, the new design for the drive should involve dedicated bus lanes without widening the highway. Not only would a ten-lane drive be an even bigger barrier to lakefront use, but if private vehicle drivers have eight lanes of traffic to themselves, that will encourage even more driving. Active Trans has also noted that converting two of the existing eight lanes to congestion-priced tolled lanes for buses and drivers who pay the fee wouldn’t significantly shorten travel times for transit riders because the lanes would still be full of cars. Fortunately, there’s still plenty of time to review the meeting materials as well as give IDOT feedback on the project. The next task force meeting happens this fall and a 4 th Public Meeting sometime during the Winter that is now extremely important to attend as this phase of the project comes to close. For more discussion of the IDOT presentation, including some of the proposed biking and walking improvements, check out this Twitter thread from Bike Walk Lincoln Park’s Michelle Stenzel. Would buses have dedicated ramps directly to the center lanes, or would they have to merge across 4 lanes of mixed traffic? Speaking of Belmont, I find it incredible this entire project is estimated as approx the same cost as the Belmont Flyover. Got it, thanks, that makes a lot more sense! Get over it. The outer drive isn’t yours; it’s one of the most beautiful, scenic motorways in the United States, and it is meant to be experienced from behind the wheel of your own vehicle. With Aliotta Haynes Jeremiah on the radio, of course. Chicago seems obsessed with building transit in the middle of the highways. It’s horrible. Few things are more awful than having to cross lots of car traffic to sit and wait at a stop with cars whizzing by, or, if they’re stopped, blowing exhaust in your face. SB LSD seems to be where the congestion issues are. (http://www.travelmidweststats.com/Reports/Quick/IL/LakeShoreDrive/SB/BrynMawrAve/RandolphSt) Better bus service would probably help motorists a lot more than an extra lane. The whole thing is only 7 1/2 miles long so if you got a few people out of their cars and onto other modes, everyone would move faster without having to move heaven and (literal) earth to add lanes. These numbers don’t match real world rush hour traffic. Ask any taxi or Uber driver how long it takes to go from the Loop to the north end of North LSD between 5 and 7 pm, especially when there is a Cubs night game. Will Pritzker be elected before Rauner’s auto-centric IDOT screws up Chicago (again), or will this ship have sailed? In fairness, Rauner taking over was the main thing that stopped the Illiana Tollway project. IDOT has traditionally been car-centric regardless of who’s in the Governor’s Mansion. “No bus stations are proposed within the median.” The current CTA service pattern of buses making stops every block for a couple of miles, then running express downtown, would be preserved. I watch people go speed north most days on Lake Shore Drive without any issue during those times. My allegorical experience matches the data. I have no belief that we should be adding highway lanes for Cubs traffic. The red line is a better answer there, and the capacity is being expanded there already. Seems like the long term plan would put peds in the median? Canceling the Illiana is about the only thing Rauner did that I liked. Moving forward with the ‘Dedicated Transitway – Left”, whithout the construction of any additional lanes being constructed is the best option for road users and preserving the surrounding area. Having bus only lanes for the AM and PM peak hours of traffic while looking into off-peak managed lanes where general traffic who decides to pay the toll can share the lane with buses. Ideally it would be nice to keep it bus only 24 hours but if the lane is being underutilized during certain times and there is a chance for money to be gained, I don’t see why IDOT wouldn’t like this idea. The lack of construction of an extra lane will then make more drivers consider the managed lane option (when operating as such) as an option since roadway capacity for cars did not increase. Yeah, most congestion is within the Loop streets’ section, beyond that obvious congestion additional gridlock can largely be attributed to that havoc-causing traffic light at Chicago Ave.
As for Cubs games, good god, if you are driving directly to Wrigley Field you are doing it wrong. Besides the Red Line and multiple buses serving the area, you can ride share (or some combo of public trans/ride share from the remote parking lots). The problem of how the buses get to the lanes remains though. Having to merge across 3-4 lanes of traffic is an unnecessary obstacle. Put the bus lanes where buses can go straight from the ramp to the bus lane. Better to have the buses suffer through one merge each morning, taking 2-3 minutes at most, than have them find the rightmost lane blocked by a backup on every exit ramp, as sometimes occurs at North, Fullerton, Belmont, and Irving. At the downtown end, buses will have their own ramps. I’d still prefer an option that looks more radically about removing LSD entirely and replacing with bus lanes. Or something like it, just to throw all options on the table. I should note that This may well have been an early scenario and I missed it. If what you say is true then the city should not be expanding LSD to accommodate additional vehicles for peak hour when the majority of the day the roadway is being underutilized. The purpose of the lane is to reduce bus travel time incentivizing it over personal vehicle use, thus increasing the number of people taking the bus and reducing the numbers of vehicles on the road, allowing for the road to be able to accommodate the reduced traffic and not requiring additional lanes to be built. I’d like to know how the hell there could be an “average shaving off (of) from 20 to 30 minutes in average travel times” when I clocked the estimated travel time (as per Google) at 8am this morning from Hollywood to Oak at 12 min. and to Monroe 14 minutes? Even if we allow for the absence of accidents and Google’s imprecise estimate, this figure cannot possibly be accurate. And going back to the “survey” conducted last year about public transportation, it’s important to recognize that, whereas public transportation users and bicyclists have organizations which are very effective in drumming up support for their interests, car owners have no such organizations (AAA abstains). So when a public meeting is held, you will generally get an unrepresentative sampling of responses. Furthermore, the noted comment that users of the bus service find the service too slow, overlooks the inescapable fact that the travel time from Hollywood or Belmont to Michigan Ave. is incomparably faster than the travel time southbound from Michigan and Oak to the Loop. The latter is the true problem with slow bus travel. This whole project promises to be a multi-billion $ boondoggle, a boon to contractors and to the coffers of the pols who will end up supporting the project. I say cut the friggin’ stoplight at Chicago Ave. and see if that doesn’t make a huge difference on the PM rush. And on a personal note: I drive the drive, but almost never in rush hour, I bike the lakefront trial when the weather is nice (like today, from Aldine to NW Mem. Hospital), and take the bus when the weather is bad or the parking non-existent downtown.